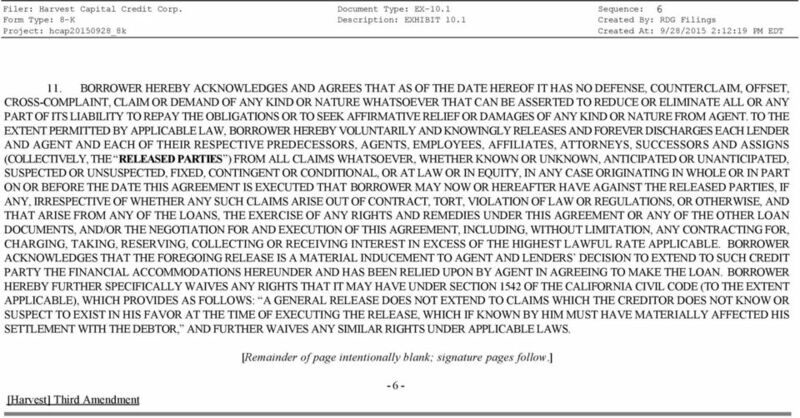 Download "UNITED STATES SECURITIES AND EXCHANGE COMMISSION Washington, D.C. 20549 FORM 8-K"
2 Document Type: 8-K Description: FORM 8-K Sequence: 2 Item 1.01 Entry into a Material Definitive Agreement. 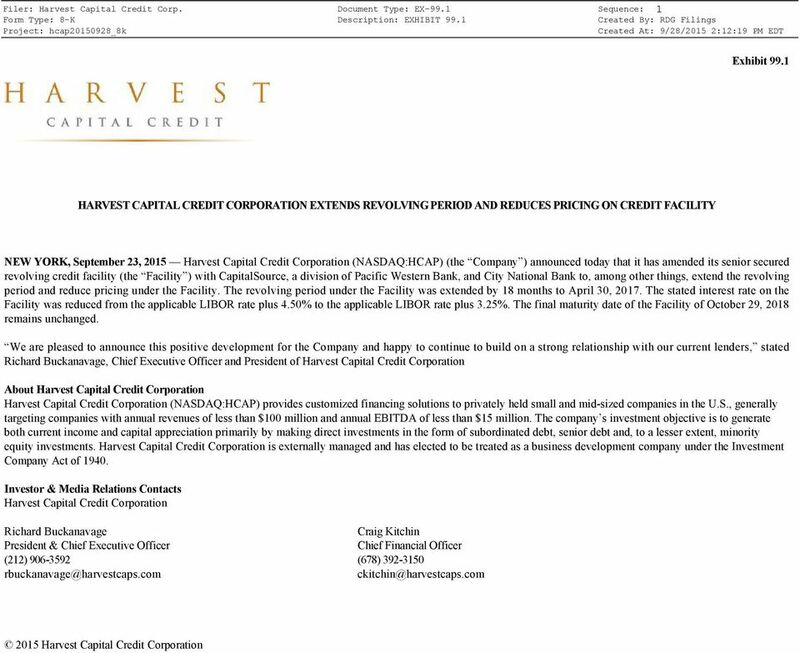 On September 22, 2015, Harvest Capital Credit Corporation (the Company ) entered into a Third Amendment (the Amendment ) to its Loan and Security Agreement dated as of October 29, 2013 (the Loan Agreement ), by and among the Company, Pacific Western Bank (successor-by-merger to CapitalSource Bank), as agent and a lender, and each of the other lenders from time to time party thereto, including City National Bank. The Loan Agreement was amended to, among other things, (i) reduce the interest rate on loans from the applicable LIBOR rate plus 4.50% to the applicable LIBOR rate plus 3.25%; and (ii) extend the revolving period by 18 months, so as to expire on April 30, 2017 instead of October 29, The extension of the revolving period also reduces the amortization period under the Loan Agreement from 36 months to 18 months. 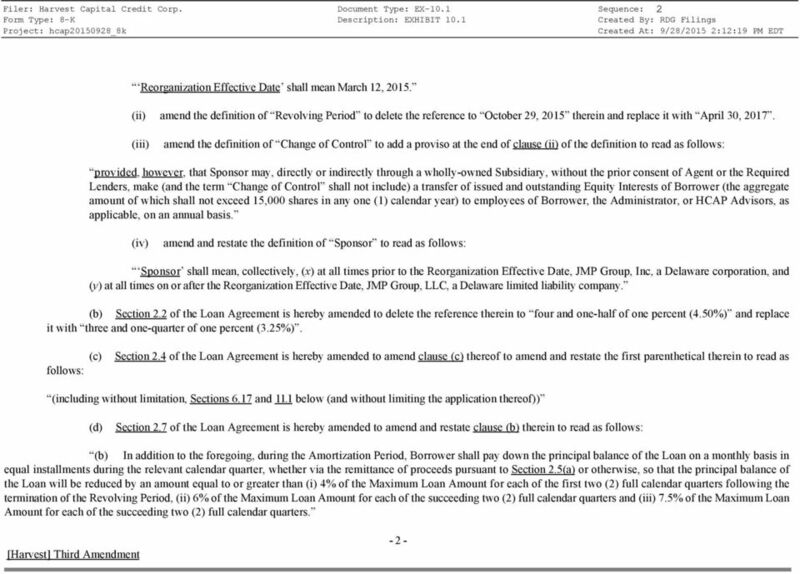 The maturity date under the Loan Agreement remains unchanged at October 29, The above summary is not complete and is qualified in its entirety to the full text of the Amendment, which is filed as an exhibit hereto. 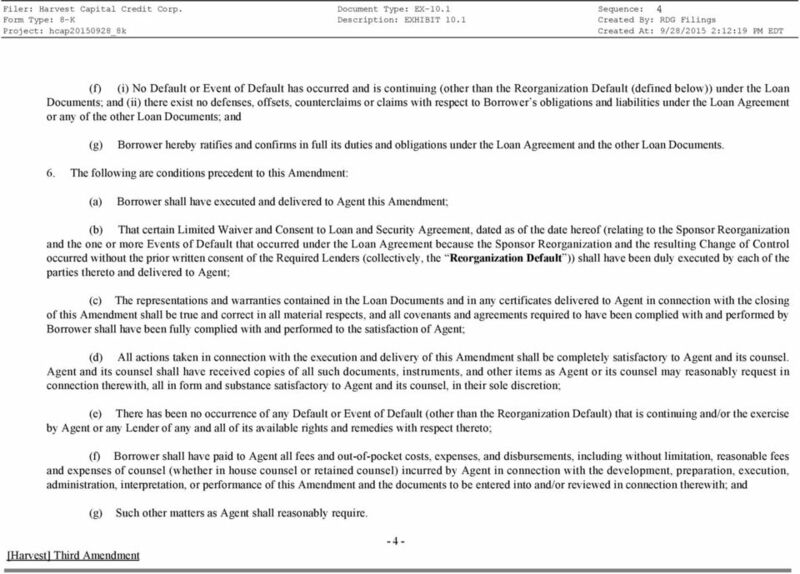 Item 2.03 Creation of a Direct Financial Obligation or an Obligation under an Off-Balance Sheet Arrangement of a Registrant. 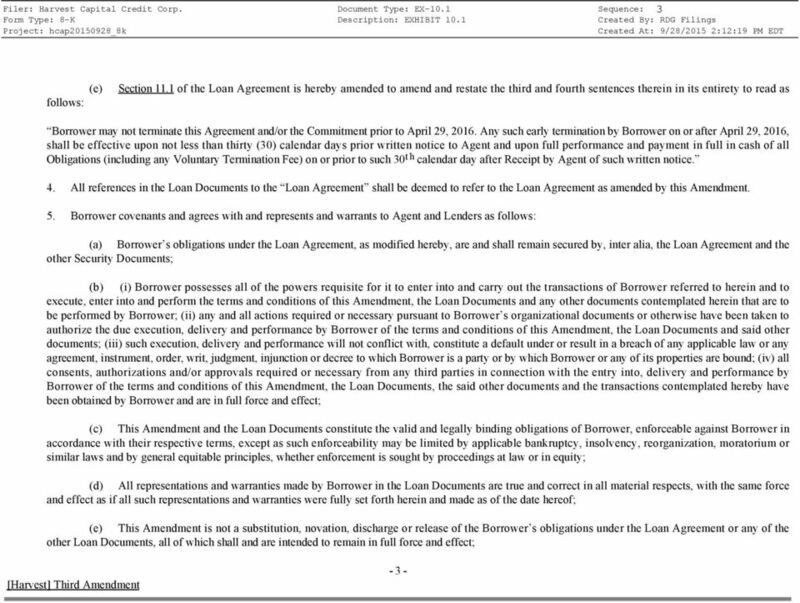 The disclosure set forth above under Item 1.01 is incorporated by reference herein. Item 8.01 Other Events. 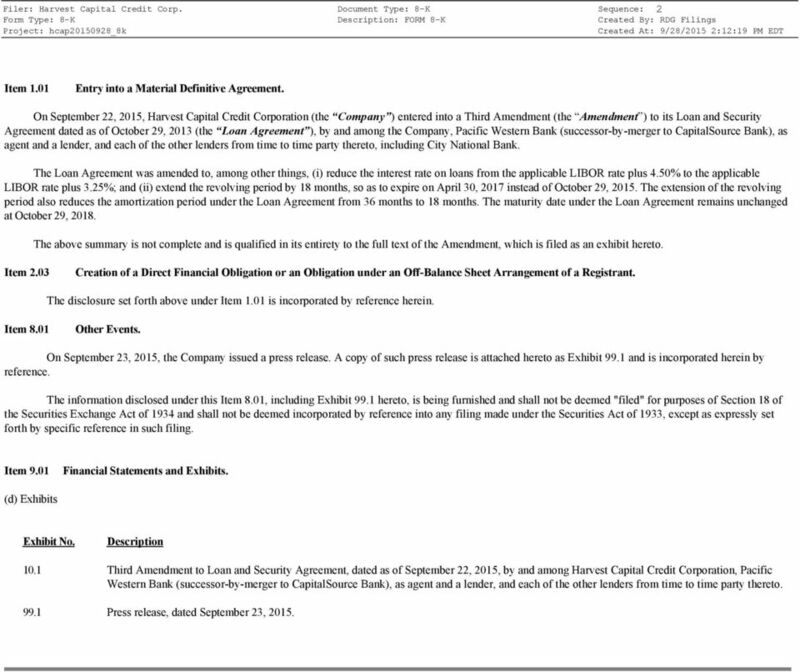 On September 23, 2015, the Company issued a press release. A copy of such press release is attached hereto as Exhibit 99.1 and is incorporated herein by reference. 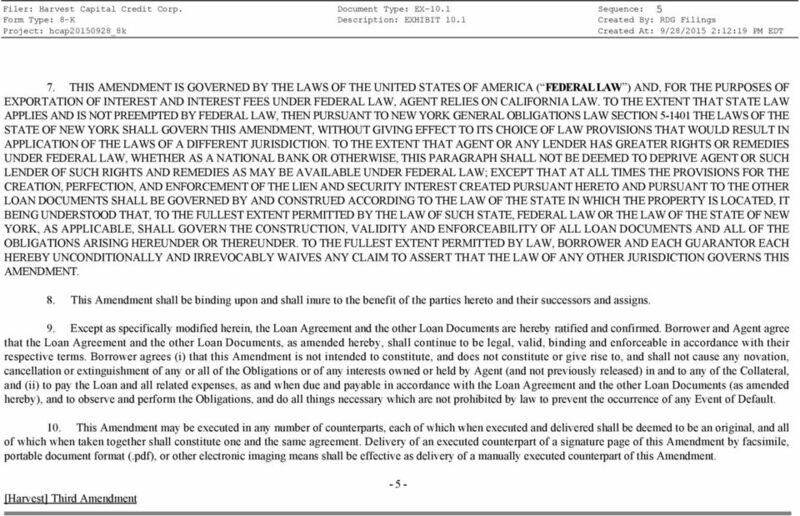 The information disclosed under this Item 8.01, including Exhibit 99.1 hereto, is being furnished and shall not be deemed "filed" for purposes of Section 18 of the Securities Exchange Act of 1934 and shall not be deemed incorporated by reference into any filing made under the Securities Act of 1933, except as expressly set forth by specific reference in such filing. 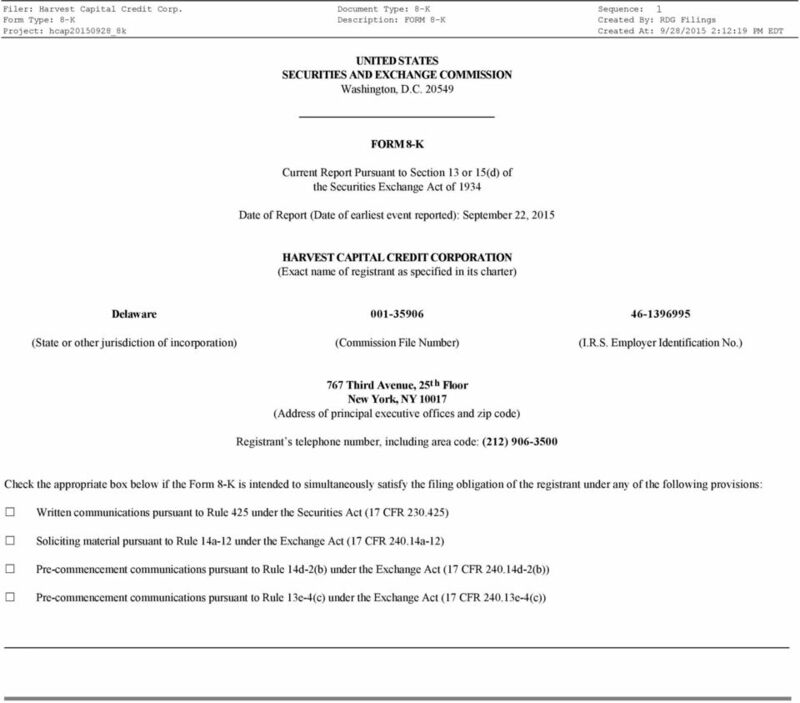 Item 9.01 Financial Statements and Exhibits. (d) Exhibits Exhibit No. 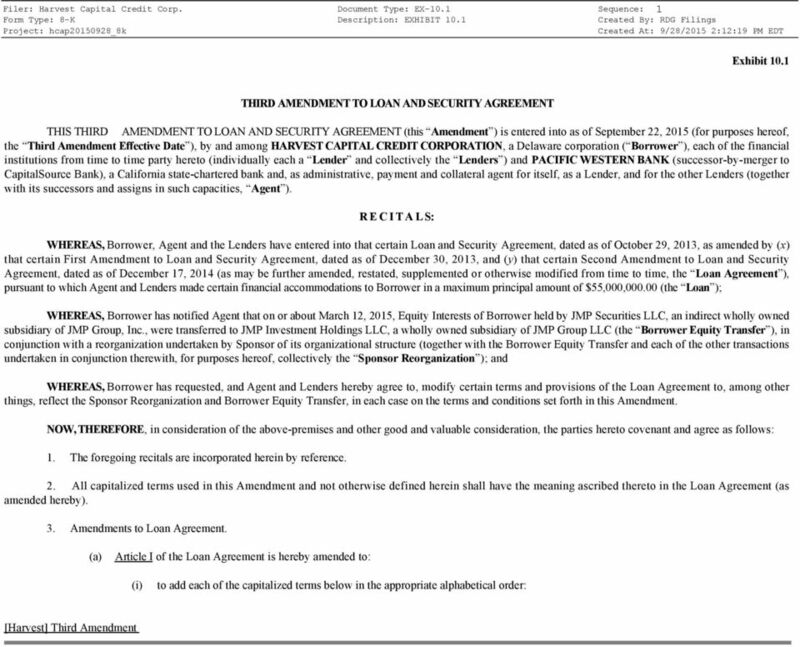 Description 10.1 Third Amendment to Loan and Security Agreement, dated as of September 22, 2015, by and among Harvest Capital Credit Corporation, Pacific Western Bank (successor-by-merger to CapitalSource Bank), as agent and a lender, and each of the other lenders from time to time party thereto Press release, dated September 23, 2015.